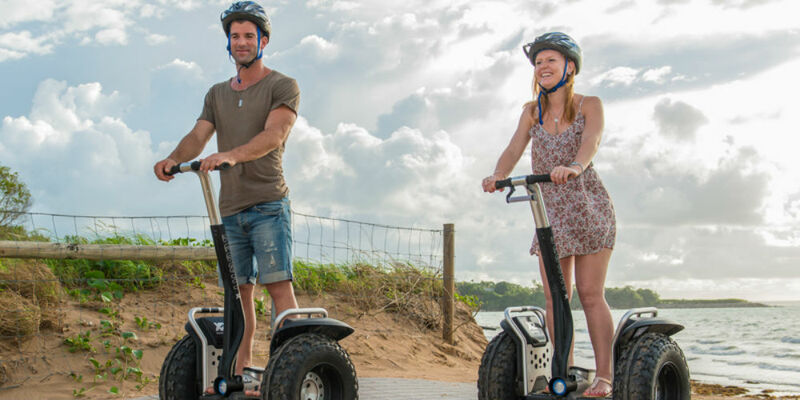 Experience all that Darwin has to offer with our sensational Segway adventure tours. We are constantly developing exciting new tour packages throughout the Northern Territory to take advantage of the fun that only a Segway can deliver. In fact, one of our team members is out right now working on a new concept. STAY TUNED! Repeat customers will appreciate our new tour plans, especially some of the concepts currently being investigated. Newcomers to the Segway are always welcome. For the first encounter with a Segway, we provide free training that is short and sweet. If you’re a first-timer, you’ll be gliding like a pro within minutes. Sunset tours in the Botanical Gardens. Military History Tours at Darwin city, the Esplanade and East Point, East Point Military Museum (co-ordinated by Military Historian and author Dr Tom Lewis, and Mr John Hart. Self-Hire and Drive – Rent a Segway with your own plans to enjoy the day, such as family outings. Segway Tours Sales and Leasing NT is the qualified Segway service agent in the Northern Territory and one of only 3 in Australia. Segway Tours Sales and Leasing NT supplies Northern Territory businesses with Segways for commercial applications. Our leased Segways are dramatically improving efficiencies in warehouse, council and security operations – in fact, all commercial situations in which foot travel plays a significant role, including airforce and marine applications.